Things are heating up in NY. These kinds of suits are almost never successful. To show a "taking" they must show the land is unable to be used for other purposes. Mineral development rights are always a gamble. 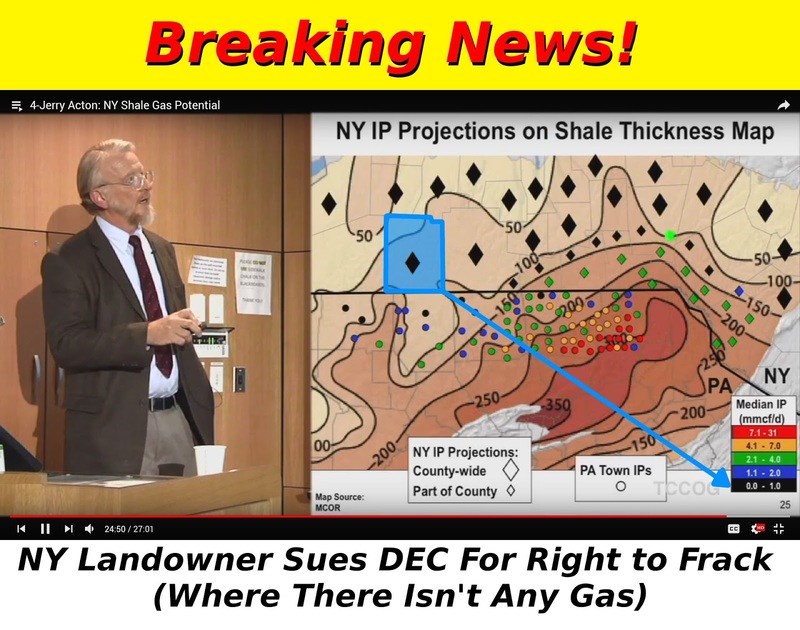 > "The Morabitos own land in Allegany County within the gas-rich Marcellus Shale formation,"
Allegany County? It's not "gas rich" according to Team Acton/Brock/Allstadt/Northrup. It's less than 4,000'ft thick and less than 150'ft thick. That's a double whammy according to Jerry Acton's model. ALBANY - An East Rochester lawyer waging a years-long battle over New York's hydraulic fracturing ban is taking a new approach, filing a lawsuit last week attempting to force the state to compensate him for the oil-and-gas rights on his land. David Morabito and his wife, Colette, are suing the state Department of Environmental Conservation in federal court, arguing that the state essentially took their property rights by preventing them from allowing high-volume fracking on their land. The Morabitos own land in Allegany County within the gas-rich Marcellus Shale formation, which was once targeted by natural-gas drillers looking to pay landowners for their mineral rights until Gov. Andrew Cuomo's administration banned high-volume fracking in late 2014. Their case centers on the constitutional "takings" principle in the Fifth Amendment, which prevents governments from taking private property for public use "without just compensation." In his lawsuit, Morabito called the Cuomo administration's decision a "complete sham and a constitutional 'taking.'" "(The) actions taken by the State of New York ... are not based on science, technology or even conservation," Morabito wrote in his Dec. 12 lawsuit. 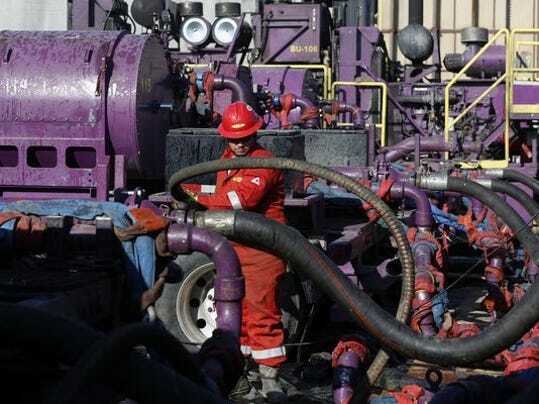 Fracking, as the technique is known, is the use of chemical-laced water injected deep underground to create fissures in underground rock formations and release natural gas and oil. Technological advances over the last 15 years had allowed the technique to be used in horizontal gas wells, opening up previously unreachable formations like the Marcellus Shale, which is believed to be richest in the Southern Tier. Cuomo's administration announced in December 2014 that it would not allow high-volume, horizontal fracking to proceed in New York, pointing to a report from the state Department of Health that questioned its affect on human health. It was the culmination of a seven-year review process that spanned two governors and spurred countless protests and rallies across the state, with anti-fracking activists often picketing outside Cuomo's events urging him to ban the practice and pro-fracking landowners saying it would be a boost to the economy. Erica Ringewald, a spokeswoman for the DEC, declined comment on Morabito's suit. "DEC does not comment on pending litigation," she said. Morabito's suit does not specify how much compensation he's looking for, instead saying that would be worked out at trial. He reserved the right to open it up to a class action. The attorney, who is representing himself, first challenged the ban in state court in May 2015, arguing that it didn't have legal merit in part because the DEC had regulated vertical fracking for more than two decades. His suit was ultimately dismissed when a state Supreme Court justice ruled he didn't have standing to sue because he never formally applied for a drilling permit, a decision that was upheld by the Appellate Division earlier this year. At the time, Morabito said the decision would allow him to pursue his claim in federal court, which he is now doing. "I look forward to helping the citizens of Western New York, and in particular, the Southern Tier of New York state," he said in an April statement.